Custom designer Evilos (@EvilosArt) has finished his latest project. 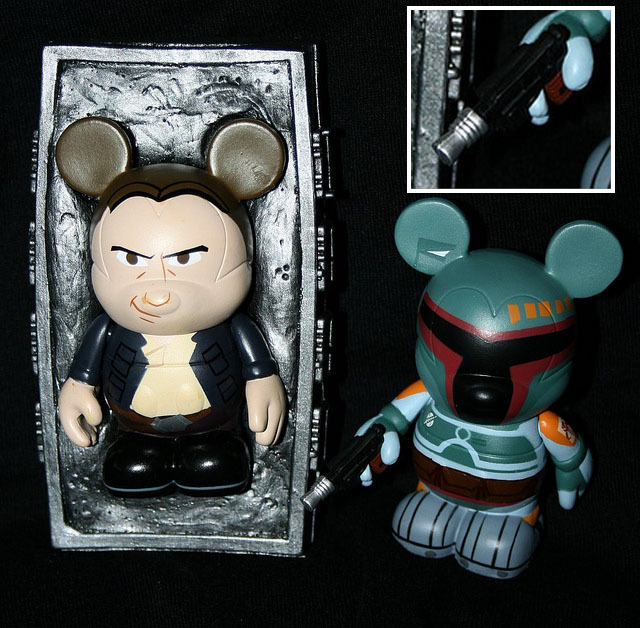 Borrowing from his previous, Mickey in Carbonite which we post about a little while ago, Evilos has made the figure inside the carbonite removable. Now not only Han Solo can go in, but Darth Vader can win and Luke Skywalker can fall for his trap. Or even Kermit the Frog. For me, however, the most interesting part of the picture he put up was the laser gun that Boba Fett has. (Enlarged in top right of photo) That didn’t come with the original vinyl! I like it a lot.